For more than 125 years, the dignity of work has been at the heart of Catholic social teaching. Now it needs to move to the center of national debate. Groundbreaking and cross-cutting studies from the Brookings Institution and American Enterprise Institute, Convergence Center for Policy Resolution, and Bread for the World have cut through the partisan and ideological stalemate and proposed policies and private sector actions to put work and workers at the center of our divided economy and polarized politics. 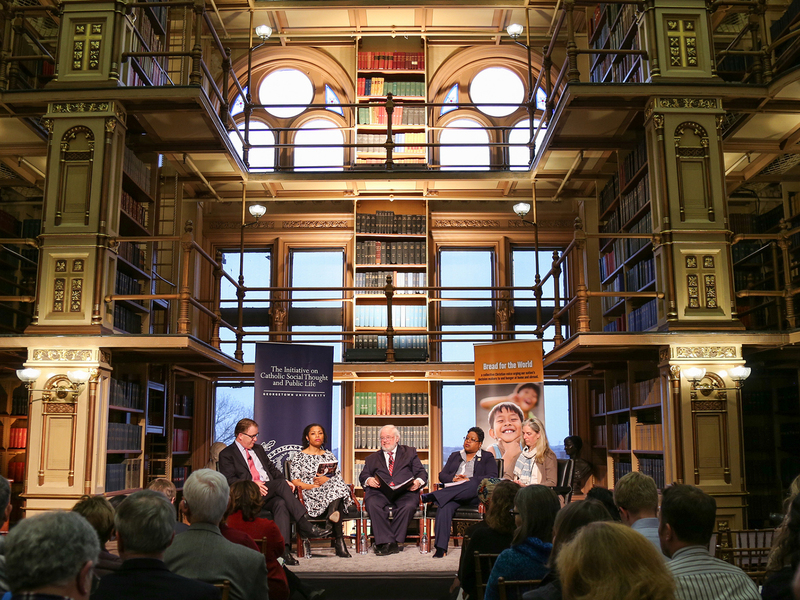 This Public Dialogue brought together key participants in these cross-sector efforts and other respected leaders and explored how we can promote the dignity of work and workers in American life. 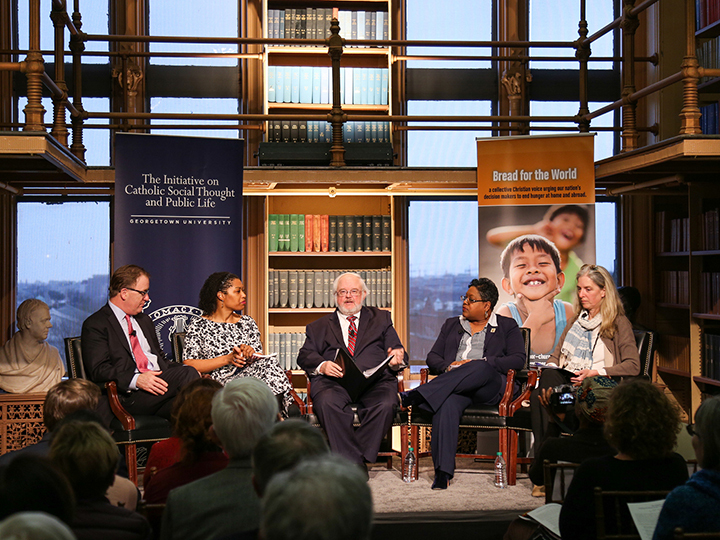 This dialogue on the human, moral, economic, and policy imperatives of securing decent work and decent wages in our economy and nation included Katie Corrigan, AFL-CIO deputy chief of staff; Robert Doar, incoming president of the American Enterprise Institute and participant in the Brookings-AEI study; Romanita Hairston-Overstreet, director of 21st Century Jobs, Skills, and Employability at Microsoft; Ashley McSwain, a national leader on reentry and employment issues; and a labor leader from AFL-CIO. 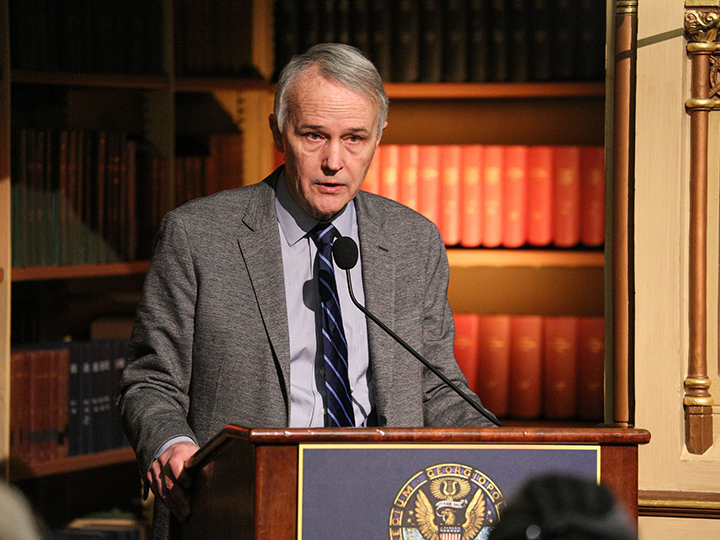 John Carr, director of the Initiative on Catholic Social Thought and Public Life and a participant in the Convergence project, moderated the dialogue. David Beckmann, president of Bread for the World, opened the gathering. Why should the dignity of work be a key priority on the national policy agenda? What are the challenges the nation faces in respecting work and the rights of workers? What are the moral and human costs of our failures on this issue? How can businesses, labor, government, and community institutions work together to invest, train, and lift up workers and promote a skilled workforce? What are the directions for policy in making decent work and decent wages a centerpiece of economic and national life? 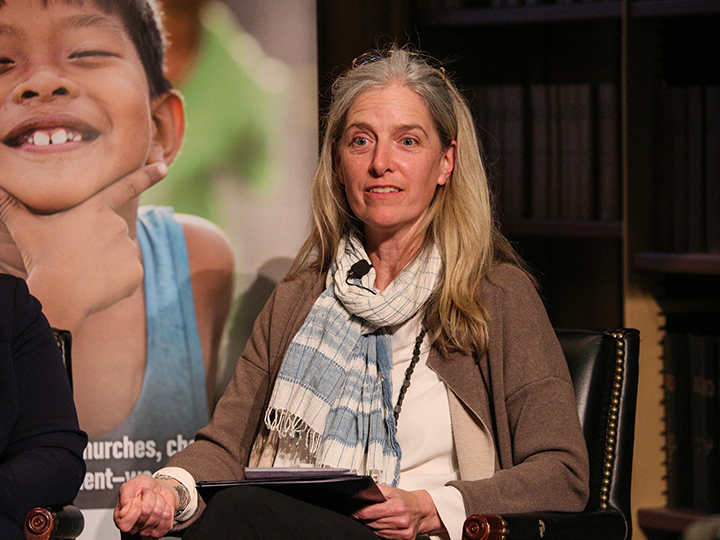 This dialogue was co-sponsored by the Initiative on Catholic Social Thought and Public Life, Bread for the World, and Convergence Center for Policy Resolution. Katie Corrigan is the AFL-CIO deputy chief of staff, a leader on the AFL-CIO’s Commission on the Future of Work and Unions, and alumna and former visiting professor of Georgetown Law. 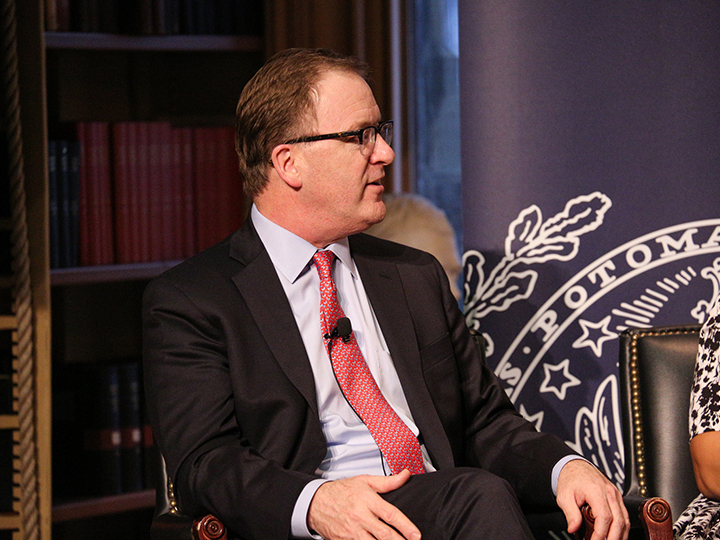 Robert Doar is the incoming president of the American Enterprise Institute, former commissioner of NYC’s Human Resources Administration, and participant in the Brookings-AEI study. Romanita Hairston-Overstreet is the director of 21st Century Jobs, Skills, and Employability at Microsoft and a stakeholder in the Convergence “Working Up” dialogue. Ashley McSwain is the executive director of Community Family Life Services, founded by the Lutheran church, and a national leader on reentry and employment issues. David Beckmann, president of Bread for the World, frames the evening's conversation with opening remarks. John Carr, director of the Initiative on Catholic Social Thought and Public Life, discusses the dignity of work with the panel. 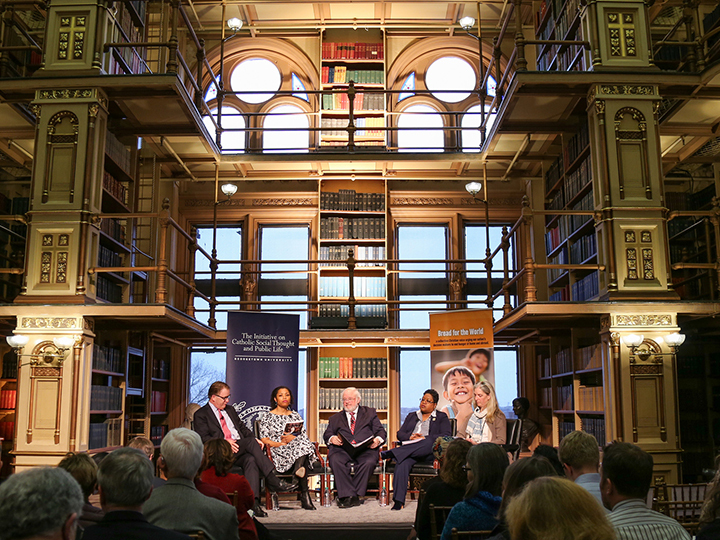 Panelist Robert Doar, president of the American Enterprise Institute, says the most disadvantaged workers should be the focus of national efforts to increase work and wages. 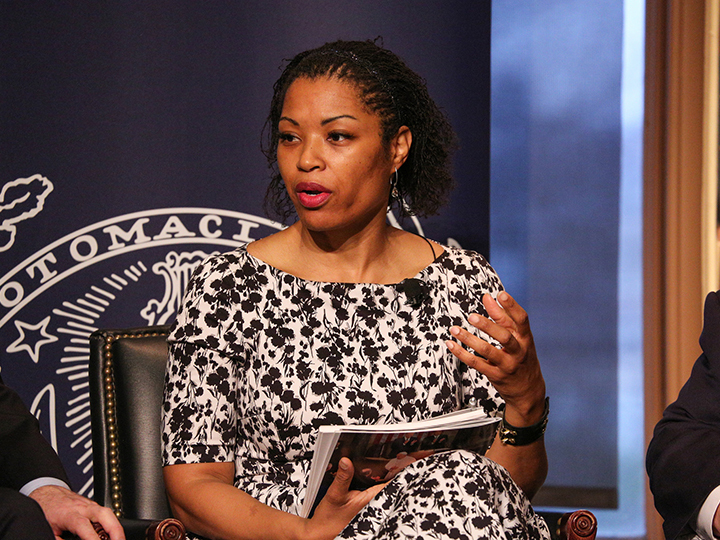 Panelist Romanita Hairston-Overstreet, director of 21st Century Jobs, Skills, and Employability at Microsoft, shares her thoughts on the dignity of work and workers. 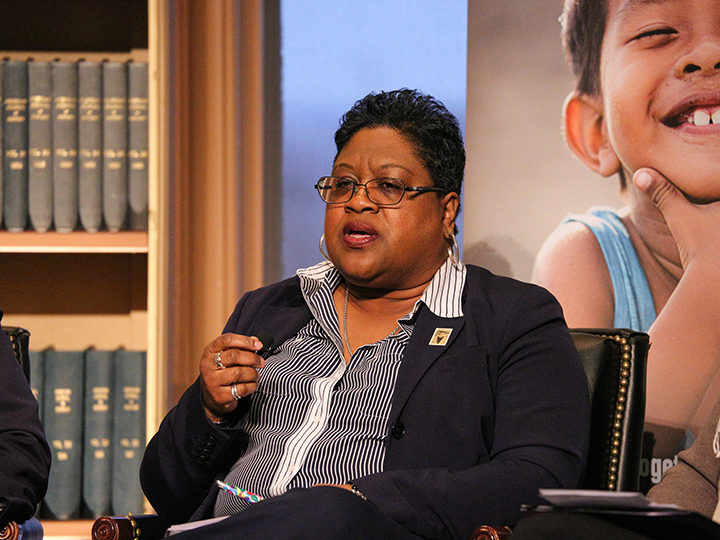 Panelist Ashley McSwain, executive director of Community Family Life Services, shares the multiple barriers to employment that women of color coming out of prison face. Panelist Katie Corrigan, AFL-CIO deputy chief of staff, discusses why the dignity of work be a key priority on the national policy agenda. Panelists of March 25 Public Dialogue on "The Dignity of Work: Putting Workers at the Center of a Divided Economy" in Riggs Library.